Our client relinquished a 7-11 store he had owned for years and wanted to leverage the exchange into several replacement properties. The first replacement property was an industrial property in Oregon. This leg of the exchange was to be an improvement exchange with the purchase of the existing building and major improvements to be completed. We created the EAT(exchange accommodation titleholder-an LLC) to hold the property during the improvement period and the property was acquired. Financing for the improvements and permanent financing for the project was arranged through a local bank. The improvements were completed and the property was transferred to the exchangor. For the second replacement property a fast food restaurant in Texas was selected. Since the current lending environment requires larger down payments it became apparent there was going to be a need for more capital to complete the acquisition. Since the exchangor knew of the opportunity to utilize IRA funds for the acquisition of real estate he asked whether it would be possible to complete his exchange into a property that combined the 1031 money with IRA money… Our answer was yes! Since section 1031 requires an exchangor to have continuity of vesting and go across or up in value and equity between the relinquished and replacement property for total tax deferral it was clear that a TIC (Tenancy In Common) structure would need to used. By acquiring the property with the 1031 being TIC with the IRA’s LLC we could satisfy all tax and legal requirements of both. In the end, our exchangor opted to add personal money to complete his 1031 exchange while taking further advantage of today’s Real Estate investment opportunities by purchasing using his new checkbook IRA created with the help of IRA Advantage. 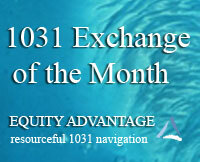 Can an 1031 exchange be combined with an IRA investment? The above transaction exhibits the possibility of combining funds to acquire more or larger investments. Though in this example it ultimately did not happen, you can clearly see the opportunity does exist. We often hear investors say “if I only had the money I’d make that investment”. Consider the fact there is over $4 trillion in retirement funds, that is an awful lot of potential investment capital! You are spot on. Wise counsel.